Set in the crypt of St Giles Church in Camberwell, Jazz Live offers a popular series of live music nights in unpretentious surroundings. 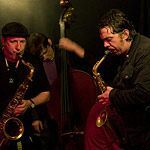 "Located in the Crypt of St. Giles Church at the heart of Camberwell, we have been putting on jazz concerts since 1995. Doors open at 8pm. First set 9.30. Reasonably priced bar and food. What did you think of The Crypt? The Crypt is a decent jazz club offering good food, drink and music, and is aptly named based as it is in a 300-year-old basement. The Crypt is within the foundations of St Giles church in Camberwell but it’s more like a dusty cellar bar than some resting place of remains – obviously. Unlike the smoother jazz clubs of Soho, The Crypt’s got cobwebs, dust and dirt. No Pete Doherty style Jazz after Dark gimmicks down here. The club has a low ceiling and packs itself with tables and chairs forced intimately close together. The performances happen in the area at the foot of the stairs that is less stage and more a collection of instruments with drums and a piano being the constant fillers. The club eats some way into the base of the ground beneath the church as it accommodates more drinking room, plus a bar and basic kitchen. The tables are old and varied with tea lights and lamps. It’s a simple set up, and just squashing into such a novel venue is enough. Jazz at The Crypt feels avant-garde. Although the genre isn’t breaking new boundaries here and the audience is largely over the age of thirty, there is a faint air of revolution. Putting on the night beneath a church lends it a secrecy that you might connect with some kind of Wold War Two resistance, and inside you imagine the older jazz enthusiasts as former Parisian bohemians reliving those dangerous, radical days. The eyes twinkle with memories of clandestine meetings in the vaults that lined the Seine. Jazz at the Crypt is packed and the atmosphere is delicate but busy. People aren’t loud and there isn’t that general hubbub that usually fills clubs. If you look around then you notice that a lot is being said without words. It’s romantic and on a lot of tables you’ll see couples giving each other doughy eyes and fixed stares. Jazz live isn't about the lounge fodder of Cullum et al, these are the types of musicians that leave you in awe at the precision of the sounds that they're producing. The bands change every week but recommended is the Tomasso Starace Quartet. There's no pretense as they play without front or ego, it never seems like an act or even performance, but a trial. You witness each musician reaching this intense and insular catharsis as if there's nobody else there - it's the spirit of jazz, as they tumble into the J hole. The intense passion is really remarkable and even if it's your first experience of live jazz you'll get a lot out of the spectacle. Food is served throughout the night at The Crypt. There are tables everywhere and the prices are so good that it seems worth heading there for your dinner as well as the music. The main meals are all £5 and the simple menu offers light, contemporary dishes. It includes crab cakes with salad, vegetarian sushi and a Mexican rice dish. You can snack on Wasabi peas, hummus and pitter and olives. The Crypt has a cheap bar. The house wine starts at £8 a bottle and although it's a little thin, it still has the value to make up for the slight dip in quality. The bar is small and doesn't offer a lot but there are a variety of beers and spirits. Jazz Live seems to be about the wine though and each table has twice the amount of bottles as the people sitting at it. 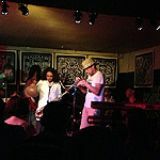 Jazz at the Crypt has a makeshift sophistication about it, offering a welcoming and totally entertaining night.